For the third year in a row Paul Goodison of the U.K. has won the world championship of the International Moth Class Association. Goodison, 40, achieved the feat today when the final day of racing at the Bacardi Moth World Championship in Bermuda was canceled due to lack of wind. 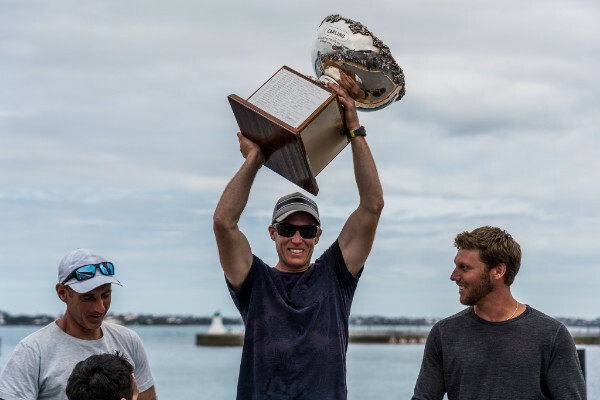 “Last year’s win was very, very special because it came straight after the Americas Cup and it was against all the guys I’d been working with and sailing against,” said Goodison, who was a member of Artemis Racing during the 2017 America’s Cup in Bermuda. The weather at this regatta frustrated everyone from competitors to observers. The conditions started as fresh-to-frightening with winds of 20 to 25 knots. By the end of the week the weather pendulum swung to fair-to-fine as warm temperatures and sunny skies were abundant but not the breeze. Goodison played through it all. Francesco Bruni of Italy, a teammate of Goodison’s with Artemis Racing, placed second overall and Rome Kirby of the U.S., who sailed with Oracle Team USA last year in the America’s Cup, finished third. Andreas John won the Masters’ Division. The 57-year-old skipper from Blankeneser Segelclub on the Elbe River in Blankenese, Germany, finished 24th overall with 111 points. Among the six Masters’ entrants he finished with the low score of 7 points, good for a 4-point advantage over fellow German Kai Adolph. Bermudian Benn Smith won the Youth Division. Representing the host Royal Bermuda Yacht Club, the 18-year-old Smith finished 31st overall with 151 points. As the lone entrant in the Youth Division he finished with 4 points.